Back home, and I am welcomed by a hailstorm?! So much for the coming of spring. I am sorely missing the sunny 80 degree weather in Dallas from this past weekend. My friend Lisa's wedding was fabulous! Although the city may not seem like a "destination", traveling south was a lot of fun, not to mention an opportunity to shamelessly chow down on barbecue, fried chicken, and tacos. And it really is true when they say everything is bigger in Texas. From houses to soft drink cup sizes, the bang for your buck would make any New Yorker green with envy. Lisa looked breathtaking of course, and her bridesmaids were decked out in Landa Designs Style M691 in Eggplant with a Chocolate sash. I'm going to wait for the photographer's photos because I know that my amateur photos simply will not do them justice! But here are a few sneak preview photos to pepper my experience. 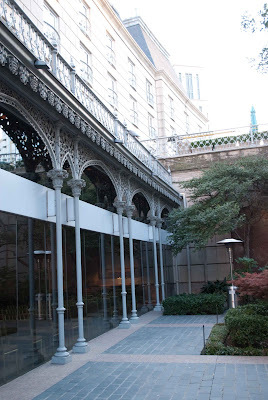 As the ceremony coordinator, I thought that the Rosewood Crescent Hotel in downtown Dallas was a dream to work with. 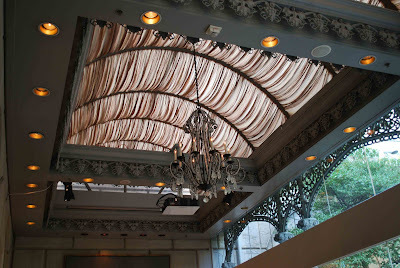 Their maitre'd was top notch and the venue was gorgeous! 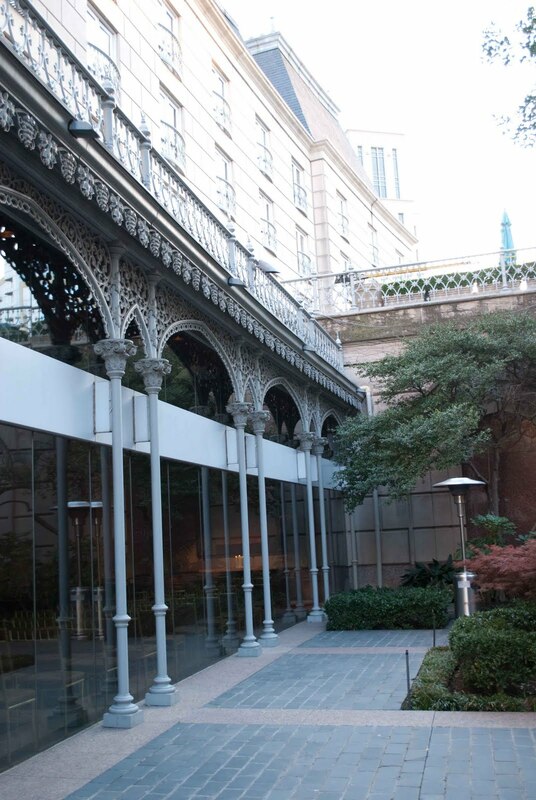 Here is an exterior of the glass window-lined Garden Room where the ceremony took place. And an interior shot of the unique ceiling. The reception room was also beautiful, with purple uplighting and gold banquet chairs. 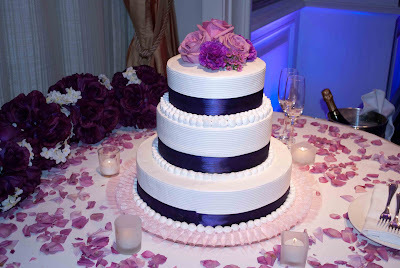 The cake was made with only dark purple ribbon lining the base of the tiers. Lisa had faith in me to "decorate" the cake by taking a few flowers from the ceremony decor and sticking them into the top tier to make a floral bouquet topper. It was actually quite fun and easy! 1. Preparation and knowledge is key. Download as much as you can from the bride. Print out schedules, cell phone #'s, etc... There is no such thing as too much information and people look to you to provide answers. 2. Anything that you suspect might be a problem at the rehearsal will most likely be a problem on the wedding day. So nip it in the bud. For example, during the rehearsal, we noticed that one of the lighters would need multiple clicks to finally start, so I picked up a new one that night and replaced it. No one wants to see a poor mother of the bride or groom struggling to light a candle. 3. The bride is always right. Yes, you may have a lot of experience in how to do things, but this isn't your day. It's your friend's once-in-a-lifetime moment. So unless it's a disastrous decision where you feel like you must intervene for her own good, just do what she wants! For you organized, Type A brides out there, don't be surprised if your future engaged friends knock on your door and ask for help in this capacity too. Personally, I think it is a wonderful way to be closely involved in your friend's special day, and alleviate everyone's stress level!